William Seeders Mosheim grew up in his father’s woodshop in the green mountains of Southern Vermont. With this unique upbringing, he began to work for his father’s business, Dorset Custom Furniture, a few years after graduating high school. But as a musician from a young age, Will was always intrigued by the idea of building his own instruments. After 2 years working in the shop full-time, refining his woodworking techniques through building high-end custom furniture, he decided it was time to start building banjos and guitars. Working nights and weekends for three years, he focused on defining and establishing his own style while continuing to further his knowledge and learn from the craftsmanship of others. Will’s intricate, unique style and technique is shaped by the many influential luthiers he has worked and learned from over the years. In 2011 at The Whetstone School of Luthiery he learned a masters approach to guitar neck shaping and design from Michael Millard of Froggy Bottom Guitars. This is also where he met fellow Vermont banjo builder Will Fielding and, at the time, Froggy Bottom employee Adam Buchwald. In 2012 he spent a week at The Augusta Heritage Center learning pearl engraving under the guidance of master banjo builder and engraver Kevin Enoch, where he also met banjo builders Pete Ross, Greg Galbreath of Buckeye Banjos, and master craftsmen Richard Newman. The following year in 2013, he went back to Augusta to study vintage instrument repair under the guidance of Bob Smakula and Andy Fitzgibben of Smakula Fretted Instruments. With the skills and encouragement he acquired from them, he made the leap to building and repairing instruments full time. 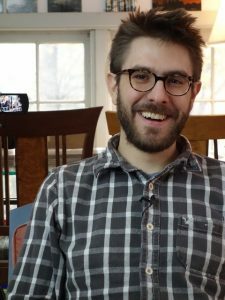 Will spent the summer and fall of 2015 working part-time for Adam Buchwald, who had gone on from Froggy Bottom Guitars to start his own guitar shop under the name Circle Strings. As a trade for teaching Adam the skills to implement a CNC to his shop, Adam taught Will the finer points of guitar building and repair. With Creston Lea and Sarah Ryan of Creston Guitars next door, the community of builders and craftsmen was also a stimulating environment for ideas and technique. All of these opportunities have greatly influenced the direction of Will’s work as well as his dedication to meticulously creating the best instruments he can design and build. Demonstrated in all of Will’s work is a strong influence of the tradition of banjo and guitar design while incorporating his own unique touch and style to his work. He strives to maintain a meticulous approach to the craft and sound of his instruments. He values and applies the lessons that are learned from old world craftsmanship while always looking for ways to improve or refine the details found within. As an artist, the banjo and guitar give Will a unique pallet to work with, and through his knowledge of wood selection and design, he brings life to customers’ ideas for a custom, personal instrument.